Solving equations is not necessarily the most engaging of activities. Of course good math students love it because they can show that they are so analytical. But for the majority of students who struggle, changing things up a bit can at least engage them a bit so that they will do the work. Here the questions are on the wheels and the answers on the clothes pins and the clothes pins and wheels each have different sets of symbols. Once student clip the clothes pins where they think they go then they flip it over to reveal the pairs of symbols. An answer key then reveals if each pair is correct. XKCD's What if blog always does something to employ calculations with large numbers. In this instalment the question that is asked is "What is the most expensive thing you could fill a shoe box with". The most interesting part of this is that the choice was not gold or some other precious metal but 64Gb SD memory cards. But not empty memory cards but those filled with $1 songs or software. So this could easily turn into a rate question of some sort (and maybe couple it with volume). A simple fraction game that you play with standard playing cards. Pair students off and they each draw two cards. They then have to create the fraction that is closest but not equal to a predetermined number. For more details follow the link below. As it turns out, we start out being pretty good at understanding probability. Maybe it's what we do to kids in school that makes them worse. In this article the researchers demonstrate that toddlers have a knack for probability. It looks like Yummy Math is moving into the 3Act math realm. 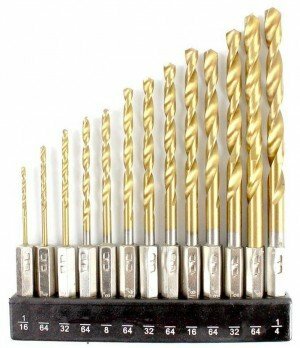 This image based task deals with the fractions of drill bit size. This is good for re enforcing fractions on a number line.